Jell-O Wants You to Play with Their New Gelatin "Toys"
Citing a decline in play time for kids, Jell-O brand gelatin hopes to get parents and children playing again with the new Jell-O Play line of tasty "gelatin toys." The new line offers a firmer gelatin that can be made into building blocks (with included plastic molds) as well as various shapes and designs (with included cutters) encompassing various themes. 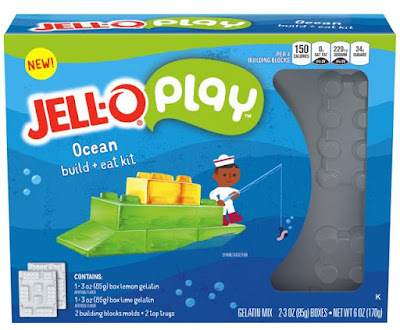 - Jell-O Play Build & Eat Kits - Plastic molds to create Jell-O building blocks that basically works like Legos with each kit following a certain theme, including ocean, construction, and jungle themes. - Jell-O Play Cutters Kits - Gelatin with cookie cutters in a variety of shapes. - Jell-O Play with Edible Stickers - Gelatin or pudding with edible stickers following various themes. All items in the Jell-O Play line are priced under $5. You can find them at Amazon.com and at select retailers including Target and HEB. The line will be launching at retailers nationwide throughout the summer.